Run giveaways, or sweepstakes draws? Create buzz while building your subscriber lists using this premium integration. If you regularly host competitions and need an embeddable solution for not only promoting prizes but your brand, Rafflecopter is an app designed to match your high-flying aspirations. Designed to make it as easy as possible to start giveaways and the like, it also offers the potential to be rebranded, so you can make the promotion totally yours. With the Campaign Monitor integration available to premium subscription customers, email addresses and entrant details can also be synced with your lists. This allows you to make the most of your promotions, by making them opportunities to not only follow up with signups, but build your lists in the process. 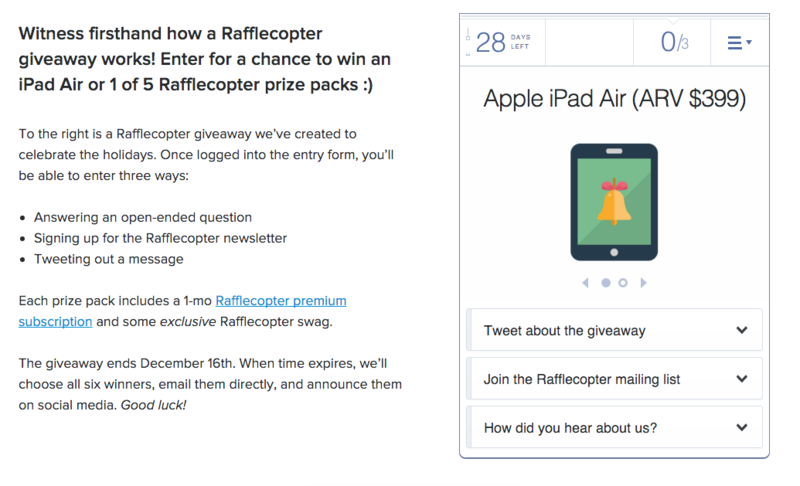 Rafflecopter is free to use, but with extra features (like Campaign Monitor support) provided to customers with premium subscriptions. Find out more at Rafflecopter.